European space agency’s Beagle 2 lander has been spotted by NASA’s orbitter MRO. 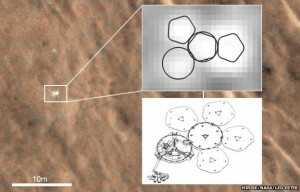 In a image released by the agency shows the lander to be fully intact with no sign of debris. The lander was supposed to land on Mars and deploy its solar panels like “petals”. From the image it seems like all the petals did not unfurl. “Without full deployment, there is no way we could have communicated with it as the radio frequency antenna was under the solar panels,” explained Prof Mark Sims, Beagle’s mission manager from Leicester University.